The work crew has been working very hard all week digging the column pits for the foundation. Fourteen pits in total had to be dug ranging in depth from four to five and half feet deep and the only tools that were available were pick axes and shovels. Unfortunately due to a current power shortage and therefore a slow internet connection I can only post a few pictures with a few descriptions. I promise to write more and share more pictures in the very near future. We thought it was a good photo op! I write with a very happy heart after two fantastic days of hard work and with many days ahead of work that can be done. The best news of the week is that after almost a full month of fighting with the bank, our money has arrived safe and sound and we are now able to take the next step forward. The money arrived on Tuesday of this week and we immediately started planning how to spend it. 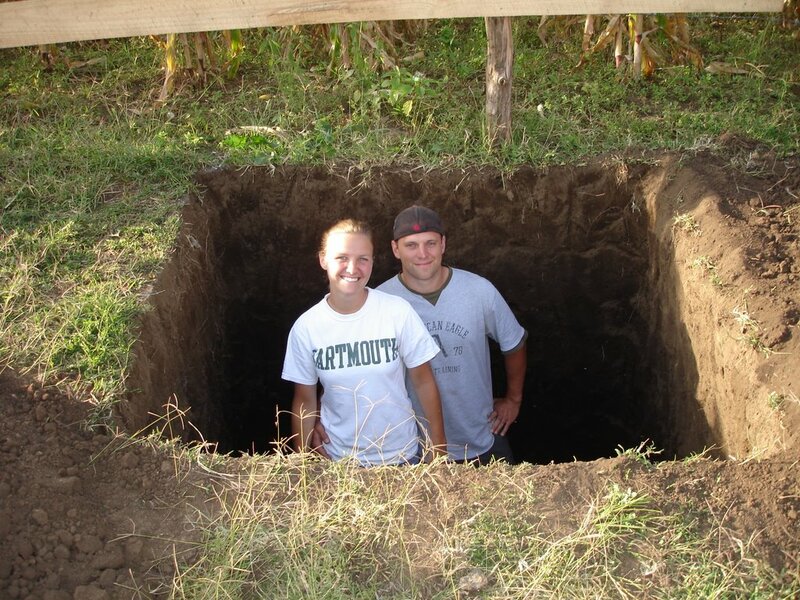 We knew that we needed to acquire another plot of land. 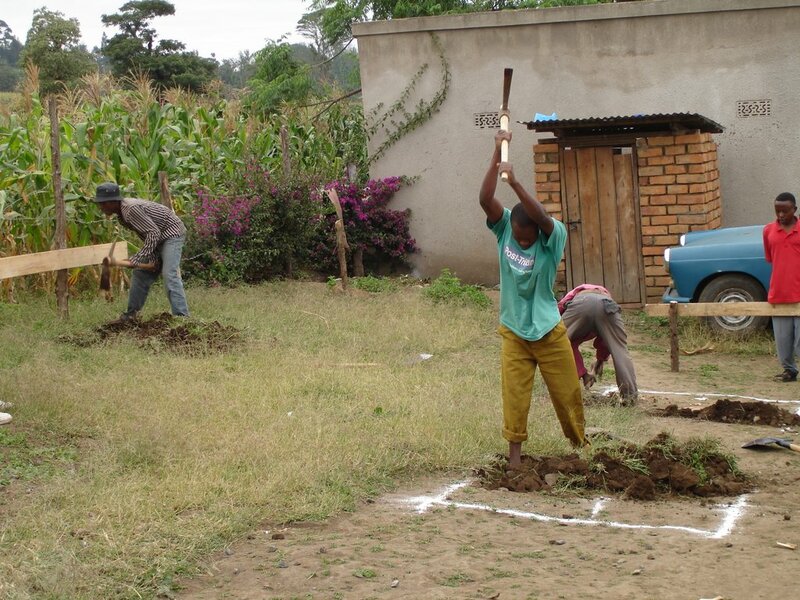 The current plot is only big enough for the current and new buildings and Tanzanian law requires that if a school is going to be built there must also be room for a playground. There is a plot of land immediately behind the original building, it is currently completely full of corn, but it is quite a large piece of land. We met with the woman who owns the plot. She is a Maasai woman. Her husband left her when her two children were quite young. Her two boys are now getting older and she needed money to put them through school and to build them each a house. It is apparently a tradition that each boy should have his own home when he becomes a certain age. She owns quite a bit of land and is slowly selling it off piece by piece. We were fortunate to meet with her and convince her to sell us the land adjacent to our plot at a fair price. So, that was our first order of business as there were many people also placing bids on the land. The woman assured us that we were the only people she wanted to sell to because she knew it was for the school. It has been amazing to me to see the support from the surrounding community for this school. Everyone is excited to see the progress and just wants to do whatever they can to help. 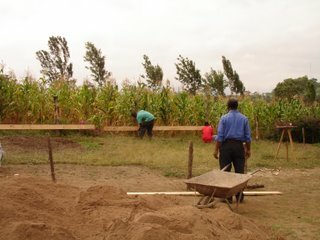 After negotiating for the plot of land we met with our engineer. He too is excited to get started. We explained to him our current monetary situation and told him that we could only give him so much at this time. He was more than happy to start with what we have. So as of Monday, we will break ground and begin building the foundation for St. Dymphna School. I am incredibly excited to be working with this engineer. We sat and had sodas with him as he told us his story and why he is so eager to help us. He grew up in this area and has been looking for a way to give back to his community. 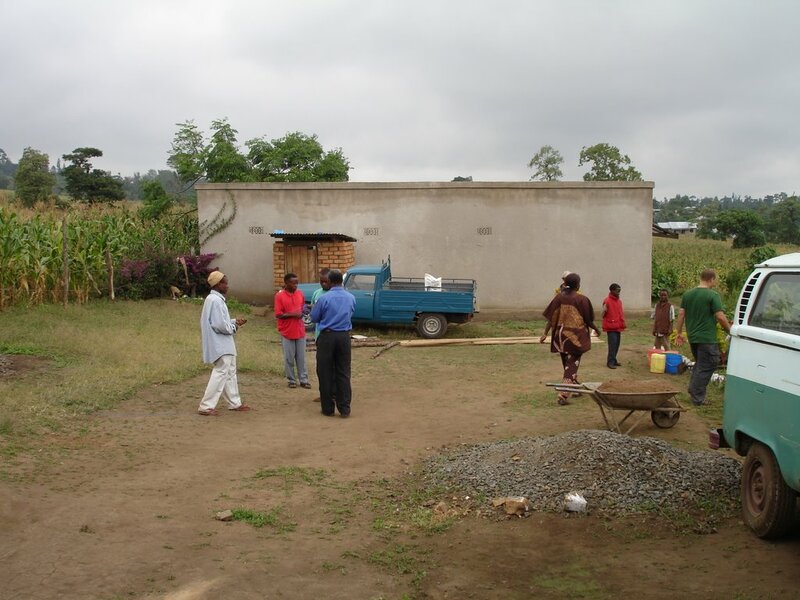 His wife works with the largest volunteer HIV support network in Tanzania and has been encouraging him to do his part and get involved in the community. When he heard about St. Dymphna he saw it as his opportunity to contribute. He is doing everything that he can to lower costs and provide us with a quality building. It is incredibly refreshing to speak with him and hear about how excited his is about the project. His excitement and his respect for the project and the efforts of all of those involved with Brick by Brick reassures me that we are working with the right man. So, once the money was spent or at least promised the fun was able to begin. After being inspired by the work of a few volunteers who painted Mary’s classroom at Patandi. (Thank you Joe, Becca, and Nikki) Bryan and I decided that we should paint the completed classroom at Olesevia. Let me take a brief moment to explain the building plan as we have been unable to scan and post the actual drawings. 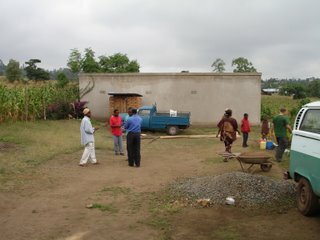 Currently, there is a building that Mary and her friends and family funded and built over the past two years. It is standing but by no means complete. It is the building in all the pictures and the building that Kari and I helped to put windows and doors into in January. As of Monday, we will begin the second phase of the building, which will actually be a completely separate building, that will run perpendicular and to the right of the building that now stands. I promise to post pictures and scanned copies of the plans ASAP. 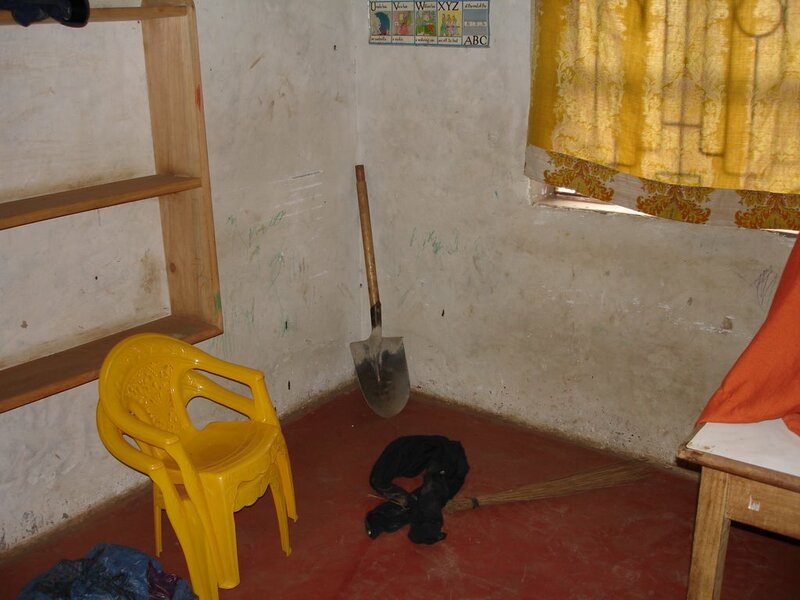 The classroom that now stands houses a class of anywhere from 3-7 students on a daily basis. 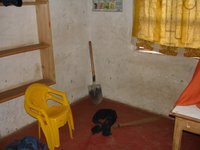 The walls had been covered in cement but had never been painted with the exception of some crayon drawings by the children. It was grey and dark and somewhat depressing so after seeing the wonders that new paint can do for a classroom we decided to see what we could do. As of today we finished the second coat of white on all four walls. I feel as though I should thank Alice and Aron for all the hours of painting they “provided me with” during my undergraduate career because I learned that painting walls is definitely a skill and is not something that just anyone can do without causing streaks and drips. As I hope that you can see from the pictures there is already a vast improvement in the room it is now much brighter and appears to be much larger. We have plans to continue painting and I’m hoping to find someone with a little more artistic talent than I possess to paint a “under the sea” mural on the wall with numbered colorful fish. 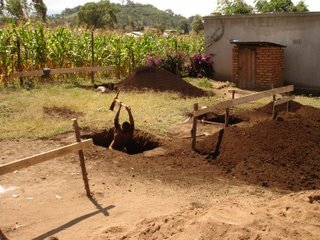 And finally my favorite part of the today was when I once again had the opportunity to plant some African roots. Upon obtaining a plot of land it is customary to plant on it so that people know it has been purchased and is no longer for sale. So, amidst the maize Bryan and I planted the first tree on our new land. It truly is an amazing experience to dig in the dirt and plant something, for some reason it makes the whole experience here feel more real and tangible. 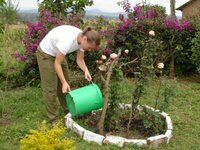 I will always be able to watch our tree grow as well as my previously planted Kayley rose garden and know that those are roots that I helped to plant here in Tanzania. Those are my African roots. The first time I sat down to write this post it began as an ode to my Tanzanian banking woes. I had had 10 full days of anguish trying to set up an account that money could be transferred to and had seen no real result, so the original form of this post was really more of a rant than anything else. However, in the last twenty-four hours my outlook has changed slightly because I realized that if anything happens quickly or easily here in Tanzania it probably isn’t legal. This realization came after having a safari guide tell me (after hearing through a third party that I was having banking woes) that he could pull some strings at a Kenyan bank and within 48 hours we could have an account in our name and have access to the cash. This came at the end of my 10th day of misery, after having three international and reputable banks tell me that there was no way for me personally to open my own account in Tanzania without first becoming/obtaining a Tanzanian residential visa. Some may have jumped at this offer, however it was clear to me then and it is even more clear now, that the easy way out here often involves bribes, backhandedness, and dark alley negotiations, and I did not want to be any part of it. So, it is taking us a little longer than we anticipated in terms of getting the money to flow this way, however, I have been encouraged that it will happen by the end of this week. We were able to open a new account using Mary’s residential status and my bank has agreed to figure out how exactly to get money into the account in the most expedient and safe way possible. As of today the money has left my account in Michigan and is somewhere in the land of wire transfers. It should hopefully be arriving safely sometime this afternoon in Arusha. Unfortunately it means that I don’t have any stories of groundbreaking or any pictures of all of the work we have accomplished, because the pictures would mostly contain grumpy pictures of me sitting in a hot bank waiting in line only to be told I don’t have the right color pen on my paper work. However, it does mean that I am working on it and will continue to work on it until the money is here in the most respectable and traceable way possible. Every story has to have some nasty turns and pitfalls. Here is to hoping that this is our biggest and only problem. My spirit was renewed in the project today when I heard word from home that Brick by Brick had received a donation from a family in Joliet. It wasn’t so much that the amount of money renewed me although I assure you that it was incredibly uplifting and exciting but it was more the letter that accompanied the check. In it I was informed that the children in this family had decided they were going to donate part of their monthly allowances to help to build St. Dymphna. And it was in this act, the act of children being taught to care for other children that they had never even met and never would meet that my faith was renewed. 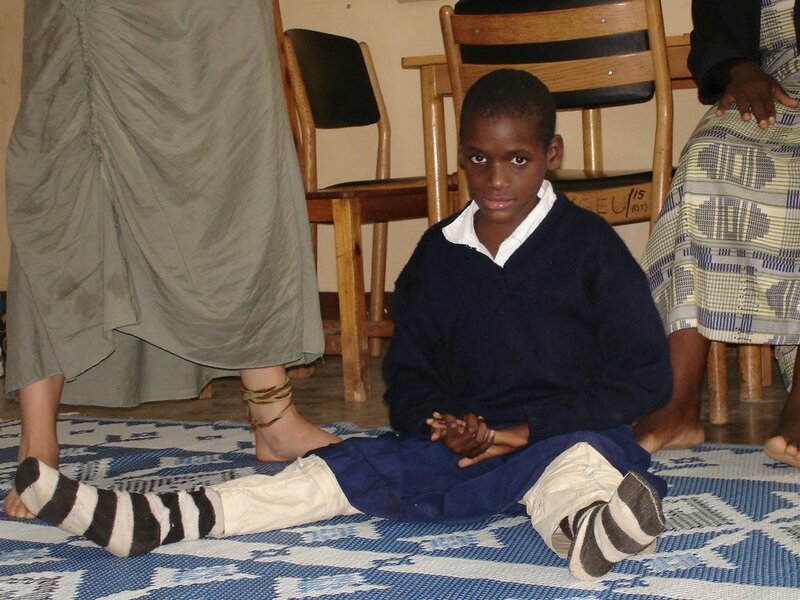 I was reminded that this project is more than just about building a school for disabled children in Tanzania, it is also about education and awareness to all who are a part of the project with the hope that we will all become better global citizens and learn to care for all of humanity regardless of race, nationality, economic status, or ability. I thought it was time to introduce you to some of the children that Mary works with and has been working with over the past three years. 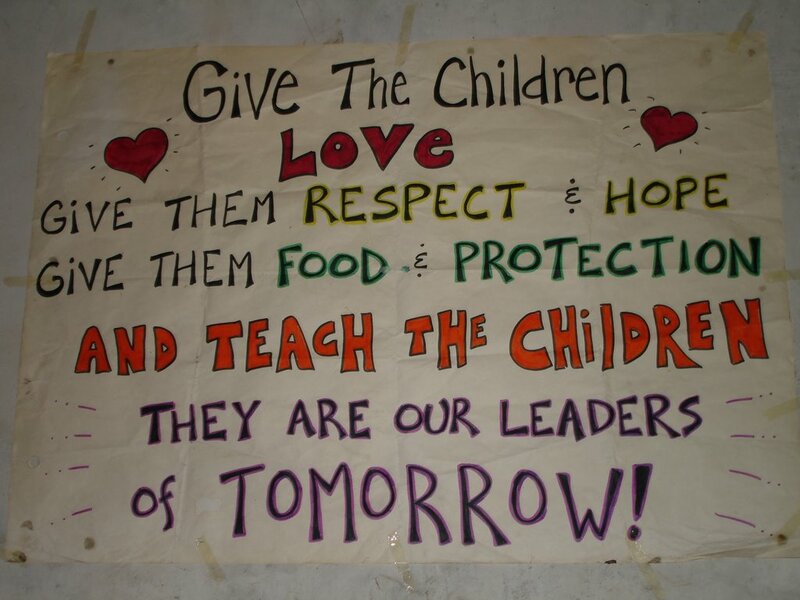 So the next couple of posts will be about a couple of the children that I have known and been fortunate enough to see learn and grow in the time I have spent in Arusha. When Kari and I were first in Arusha in 2003 one of our placements was at Nkoragana Orphanage or to be more correct, Kari's placement was at Nkoranaga and I went up there whenever there was time to visit. 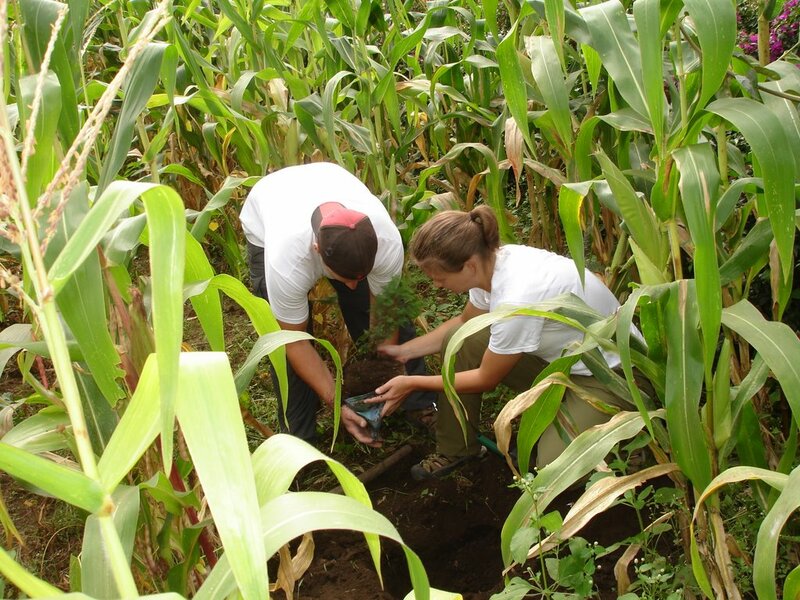 It was one of our favorite places to volunteer mostly because it was clear that it was there that we were most needed. 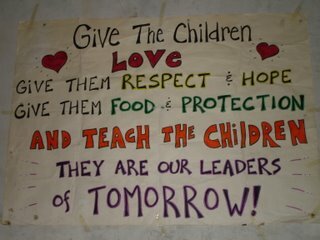 There were 32 children at the orphanage at that time and without volunteers most of those children went uncared for, untouched, and unloved. Our job as volunteers was to bathe and feed the children and then take them outside to play. For the most part it was fun, at times it was incredibly challenging. There was one child in particular that was a huge challenge. Her name was Zwadi. The pictures above are of Zwadi three years ago at the orphanage. It was clear to us at the time that Zwadi had some sort of mental disability. She was unable to communicate or play. She refused to look you in the eye and did not like being touched. 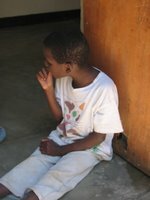 After volunteering in Mary's autism unit I began to wonder if Zwadi was in fact autisitc. She was incredibly physical, she struggled whenever one of the volunteers tried to bathe her and refused to be toilet trained. We all cared for Zwadi but to be completely honest most of the volunteers didn't like her. She was difficult and demanded much attention if one tried to care for her. There was little any of us felt we could do. 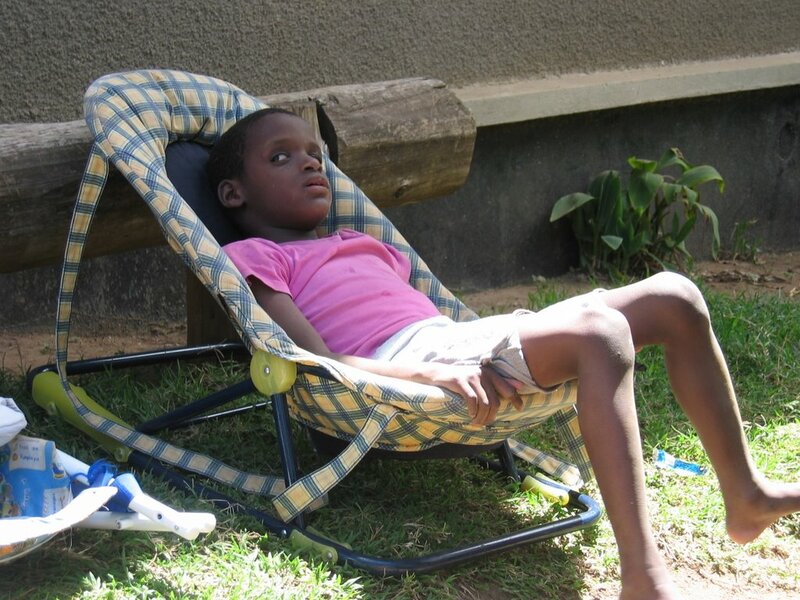 There wasn't the time or resources to work with her and we all figured that she would live her entire life at the orphanage never being able to communicate or interact with others. Fortunately when we told Mary about Zwadi she offered to evaluate her. 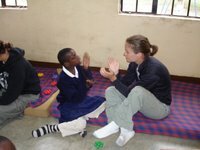 Sometime after Kari and I left, another volunteer offered to help to bring Zwadi to Mary's class each morning. 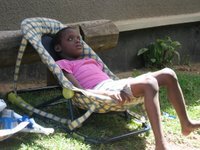 Eventually Zwadi was moved from the orphanage to Patandi boarding house where she is cared for and brought to Mary's class each morning. I am incredibly happy, excited, and proud to tell you now that after approximately two and a half years of being in Mary's class Zwadi is now doing incredibly well. She has developed a personality. She loves to clap and sing. She loves to play ball, and participate in class. She not only will sit with you and sing with you, telling you when you're clapping is off beat, but she is also able to sit quietly while others participate in class. It is incredible to see someone who was so uncontrollable and unable to function or participate in daily tasks, to not only be under her own control, but also to know and understand when someone is talking with her and to respond to requests and commands. I sat with Zwadi for twenty minutes this morning, singing, clapping, and drumming, and when it was time to finish, Zwadi said "imekwisha" which means I am finished and got up and moved on to playing kickball with another child. I cannot begin to tell you how incredible it is to see that education really does work, that Mary's program is effective. I am more certain now than ever that this school is essential. Through her class, Mary is saving lives. She is giving purpose, hope, and the ability to communicate to children who had been given up on long ago. It truly is inspiring. Zwadi is learning new activities and words every day. Soon she will be learning daily tasks like doing laundry and pouring water. She is so much fun to be around as she is always smiling, laughing, and looking for someone to play with. I am confident that with the help of Mary Zwadi will continue to grow and eventually be able to function in Tanzanian society. I will keep you posted on all of her progress and next time I will write about another child who I've known and loved for the past three years named Toomey. Toomey was Alexis' (a friend of mine) favorite child and I look forward to telling and showing everyone of her improvement. So until next time, I am doing well. Progress with the banking has been slow and painful, but I am happy to report that as of tomorrow all of our sorrows should be figured out and groundbreaking should be taking place by the end of the week. I will write more as soon as I know about the progress of the school. thank you once again for all of your interest and support.